I arrived late on a Monday night and then I took the train early to Malmo, Sweden on Tuesday, so my first full day in Copenhagen was Wednesday and I had not yet seen anything besides the train station and a pastry shop. I had reserved a spot with BikeMike Tours after hearing about it from Rick Steves. After witnessing just a little of the bike traffic, I was glad I booked a tour and would have a guide for my first foray into the city. Copenhagen is a 1000 years old and committed to keeping their streets cobbled and their footprint much the same. It was not designed for cars. Yet it is a dynamic, economically vibrant place. Bicycles allow them to move people without sacrificing the quality of life that their history offers. The cycling culture is such that people ride everywhere in all weather and with cargo bikes if they have children or a load. As one fellow tour rider from the USA noted, “No one is wearing lycra bike shorts or riding a fancy bike.” It is part of the fabric of life and very utilitarian. I digress, I want to tell you about this fabulous tour. i am not just another #$@%&*! bike tour guide. I am bike mike. I appreciated that he was being very forthright about what his tour was and was not. What it is: an exciting tour of the city at a good pace with a guide who LOVES Copenhagen and Denmark. I ride my bike as my main source of transportation and I “kissed” the curb; my bike went down but thankfully I did not. So the city cobbles and curbs can be challenging especially to riders from the USA. It is so worth the risk. I arrived feeling very jet-lagged and hoped that the fresh air and exercise would revive me. There were about 18 of us in the group with a mix of Europeans and Americans. Mike leads the way and expects you to follow, and we did. People in my group did a great job of keeping up. Mike does stop often to share information about this beautiful city and its culture. He is unabashedly proud of their socialist welfare state and the monarchy. He is a real enthusiast and he will infect you with a love of Copenhagen. He also gave good tips on restaurants along the way. Although his description of a typical Danish lunch–open faced sandwiches of pickled herring followed by a shot of snaps (schnapps)–sounded like a fast track to a nap! He said we would ride through whatever weather came our way just like a local. However, when a particularly nasty bit of rain and wind came through he let us grab a coffee at the national theater and then ride on. This added an hour to our tour but no one complained. In fact, we were all full of good will toward one another at the end. The tour was well worth the DKK 299 in cash. I also learned about these really groovy Danish locks that fit onto your bike as a permanent fixture. Mike uses them as do most people in Copenhagen. I walked across the street to the bike shop and bought 2 to use at home. Before I started my second day of cycling on the Otago Central Rail Trail in New Zealand, Nick and I stopped in Ophir. Ancient Ophir was one of Solomon’s ports where rich minerals entered the kingdom. Not surprising then there are towns named Ophir in many goldfields. This small village in Central Otago is rich with historic buildings. 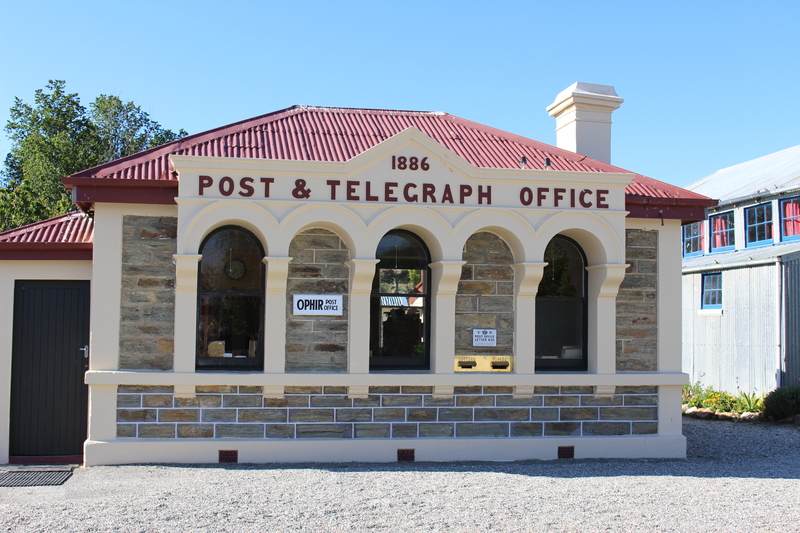 This post office is part museum, part post office, part souvenir shop. Buy a postcard and post it from here. I grew up in Sacramento which is at the heart of the gold story in California. I also spent a lot of time as a teenager in Nevada while crewing for endurance horse riders. I had a memory of Ophir Prison Band but could not remember what it was all about until I asked Google and rediscovered the crazy kazoo band. There are terrific restored restaurants and accommodation in Ophir. Many of the businesses in Central Otago are for sale, so f you fall in love with the place and lifestyle, make an offer.